Learning reinvented. 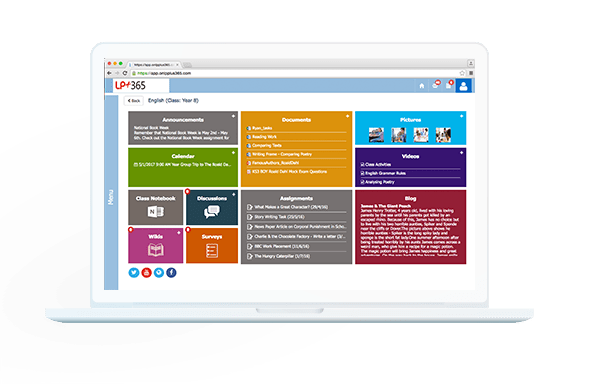 LP+365 transforms Microsoft Office 365 into your school learning and collaboration platform, making learning interactive, engaging and collaborative. LP+365 is the latest learning and collaboration platform from Learning Possibilities, developed in partnership with Microsoft. Based on research and over 10 years of experience, LP+365 brings LP+ technology to Office365, driving positive education outcomes for learners. Find all the tools you need to share resources, communicate, collaborate and manage assignments in a simple, engaging dashboard. The LP+365 App has a dynamic, and intuitive interface. It’s automatic class site provisioning and relevant tools allow users to organise resources, manage assignments easily and encourage communication, collaboration, creativity and discipline in learners. LP+365 has an intuitive and responsive design, developed to work with all Microsoft Office Mobile Apps. Full integrated with OneDrive, it enables learners to keep an e-portfolio of their work and easily organise and manage resources, projects and assignments. Our aim was to ensure accessibility was never an issue with any device. Your favourite Microsoft Office 365 tools are one-click away in addition to learning tools such as Blogs, Wikis, Photos, Videos, Email etc. We know e-safety is an important agenda in digital learning. We strive to satisfy schools and ensure data is secure within the Microsoft Azure cloud. To make learning accessible even in the most remote parts of the world, we facilitate offline access to Office web apps. We make learning fun and ease management workload for the teacher. Our assignment tool manages your learners’ work and performance on one page. Even though it only takes 20 minutes to train users on the LP+365 App, users have access to pedagogical material through an inbuilt support and professional development site. Only 20 mins for training. Manages learners’ work and performance. Inbuilt support and professional development site. Offline access to Office web apps. Simple, intuitive and fun platform. Building digital and employability skills essential for their future. Please note: To download the App from the Office 365 store you need to be the Office 365 Tenant Administrator for your school. If you do not have the Tenant Administrator rights you can still request a demo login.